The SeedForward start-up from Osnabrück recently developed an innovative and, most importantly, environmentally-friendly seed coating, which will be sown for the first time this spring. C&D Technical Applications supports SeedForward with a natural, wheat-based binding material that combines the raw materials of the coating and provides a smooth finish. Therefore, the seed coating contains only natural ingredients that don’t pollute the soil or groundwater and pose no threat to our insects. SeedForward’s organic seed treatment works in many ways: It increases the germination rate, effectively supplies the growing plant with the right nutrients and strengthens root growth, as well as improving the plant’s resistance to weather influences and pests. This promises farmers considerable savings in fertilisation and labour costs as well as stable yields, even under challenging growing conditions. KlimaExpo.NRW is propelling climate protection forward. Implementing the energy transition and reaching the set climate protection goals are among the most important current challenges for politics, business, science, and civil society. NRW is a pioneer in the field of climate protection and, already in 2013, was the first federal state to set binding climate protection targets for itself. As an initiative of the federal government, KlimaExpo.NRW presents the technological and economic potential to the general North Rhine-Westphalian public. Thanks to the initiative, bright minds from business, science and society are brought together. Not only do they and they cooperate with regional development agencies; they also liaise closely with specialist partners, associations and sector organisations. Thanks to the successes achieved to date, in addition to other objectives concerning sustainability and climate protection, Crespel & Deiters has been nominated as an official pacemaker of KlimaExpo.NRW. Ever since we commenced our entrepreneurial activities, environmentally-friendly and sustainable action has been one of our key corporate goals. We work on identifying and implementing savings potentials every day , so as to secure sustainable business workings and protect the environment for future generations. Within the framework of KlimaExpo.NRW, we have thus committed ourselves to continue working on our carbon footprint in the future and to decrease it even further, despite our planned rise in output. Loryma has been a partner of the food industry for over 40 years. In the beginning, the focus was on the production of stabilizers and emulsifiers for sauces, mayonnaises and dressings for the delicatessen industry. A different field of activity, but with intersections. When Crespel & Deiters outsourced its food division in 2001 and took over Loryma, the transformation process of Loryma into a company of the Crespel & Deiters Group began. Today Loryma is the specialist for wheat proteins, wheat starches and functional blends of wheat-based raw materials. As part of the Crespel & Deiters Group, we benefit from 160 years of experience in dealing with the universal natural product wheat; a knowledge that flows daily into our work and the advice we give our food-producing customers. Thanks to the high quality standards within the Group, we are able to ensure consistently high raw material quality in the production and supply chain. As a supplier to the food industry, we optimise the quality, taste, appearance and cost-effectiveness of industrially produced foods because we know exactly what the function and effect of wheat products is in the customer’s manufacturing process and in the finished food. In addition, we see ourselves as a trendsetter force for innovative food products. In order to make this new bundling of forces visible to our customers in the market as well, we have worked on a new image that concentrates on our experience with wheat-based raw materials and their multifaceted possibilities. Call us or send us an email! We will be pleased to advise you about the various possibilities with the Loryma product assortment. The new flour storage and separation plant is a milestone in the company’s 160-year history and symbol of it’s commitment to the location. A great deal of recognition was expressed for this at the official presentation on Thursday, 21 June 2018. 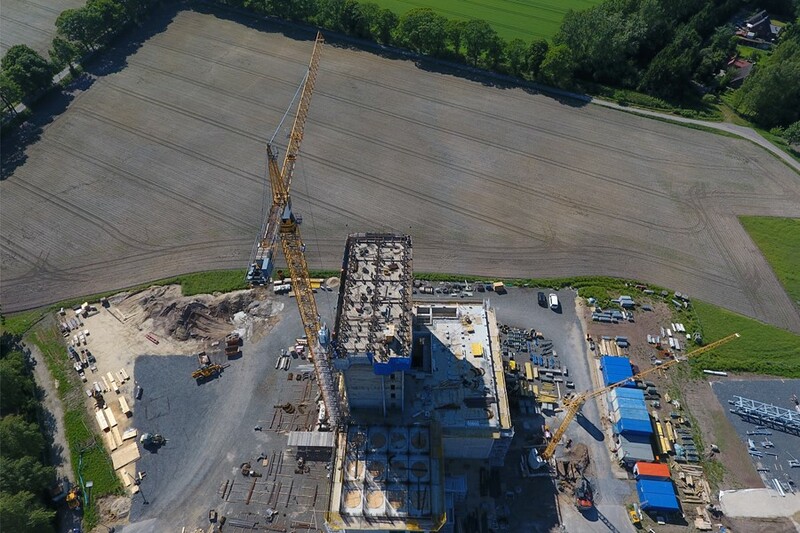 The new flour storage and separation plant is a milestone in Crespel & Deiters’ corporate history. Crespel & Deiters: MT plant officially presented. Gustav Deiters, managing partner of C&D, looked at the milestone represented by the MT plant and said that the company founders of 1858 could never have dreamt “that their foundations would develop in such a manner”. Today C&D is active in many countries and on almost all continents. Nevertheless, the “central hub” of the Group still remains the wheat starch factory on Groner Allee. A great deal has happened here in past years. The company overcame a structural crisis after 130 years of company history by standing up for itself. Things improved steadily, following a strategic reorientation that started in 1990. This also applies to the personnel figures. In 2017, C&D had 237 employees at the Ibbenbüren site alone, and almost 300 in the Group. “And the upward trend is continuing,” says Deiters. With the new MT plant, the necessary capacity expansion is achieved, in addition to the unbundling of the entire manufacturing process. With this investment, the home location will be ready for the future, Deiters explained. The managing partner said that this would allow the company to satisfy its responsibility, both as an employer and taxpayer. Deiters continues: “And we are dedicated to this industry and its industrial value creation.” This is the basis of prosperity in Germany. “We want to develop the location further and offer many young people training and further education opportunities.” And, regarding the motivation for this “mega-investment”, (Deiters) he said: “It’s about our future and about future generations, not only at C&D, but throughout the region, in Germany and in Europe.” Deiters thanked employees, shareholders and all those involved in the project for their commitment. The mayor, Dr Marc Schrameyer, spoke of “the highest respect” and “high regard” for this business decision. And it is also a sign of commitment to the region. “I am proud and grateful to have such a company in Ibbenbüren.” Schrameyer spoke of a great symbol in times of structural change. Anja Karliczek, local Federal Minister of Education and Research, spoke about seeing constant change as an opportunity. C&D, with its 160-year corporate history, is a very good example of this: “Courage and foresight have been a key component of C&D for 160 years.” The company is a “top employer in medium-sized businesses,” which deserves the highest recognition. Before the tours began, Dr Michael Christoph, authorised signatory and Head of Production and Technology, briefly introduced the new MT system. Christoph’s summary: “It’s team spirit that drives us forward. And the entrepreneurial foresight and loyalty of our customers.” He also thanked all the companies involved in the plant’s construction. During the highlight of Crespel & Deiters’ anniversary year, all involved parties were delighted to celebrate the official presentation of the new flour storage and separation plant (from left) together: Dr. Michael Christoph, authorised signatory and head of production and technology at C&D, Anja Karliczek, Federal Minister of Education and Research, Gustav Deiters, managing partner of C&D and Mayor, Dr Marc Schrameyer. C&D says the following about the new MT plant: “With it, Crespel & Deiters once again significantly optimises all process steps in production. The raw materials warehouse was restructured and significantly expanded. The new dispatch silos are used for storing and loading of, e.g. special adhesives, wheat proteins and wheat starches, and they are connected to existing production plants via pipelines. Crespel & Deiters is celebrating its 160th company anniversary this year. Crespel & Deiters has been working consistently and sustainably with the universal natural product of wheat since 1858. Everything we do comes from our knowledge of its diverse range of possible uses. As a family-owned company, we develop innovative products from wheat for our customers, with vision, technical expertise and knowledge. Today Crespel & Deiters is an internationally-active, owner-managed corporate group. Learn more about our long and eventful corporate history. Starch in all of its forms and facets is a versatile raw material with different functions and utilisation types. Thanks to its versatility, starch is, e.g. used comprehensively by food producers. However, especially due to the large range of possible uses, consumers would like to gain a better understanding as to where starch-based ingredients come from, and what they are used for in food production. Starch Europe, as an stakeholder of the European starch producer, is aware of this challenge and feels responsible for providing fact-based information on starch-based ingredients. This is done with the purpose of strengthening the faith in the food consumed by us. Which is why Starch Europe has established a new Q&A platform at www.starchinfood.eu . This platform invites interested parties to find out more about starch-based ingredients. It includes starch and starch-based ingredients such as glucose syrup, glucose-fructose syrup and maltodextrin in foods. The Crespel & Deiters Group is a member of Starch Europe and has developed wheat-based starches for the food and non-food sector for more than 150 years. We develop modern food concepts or also partial solutions and are the specialist for refined, functional ingredients that focus strongly on wheat-based starch products. We are happy to answer your questions regarding your special food-technological application and the functional effect of native or modified starches. Please simply click on our contact form and send us a message. As a part of the Climate Protection Action Plan 2020 (Aktionsprogramm Klimaschutz 2020) and the National Action Plan Energy Efficiency (Nationalen Aktionsplan Energieeffizienz) (NAPE), which are under the auspices of the Federal Ministries for Economic Affairs (BMWi) and the Environment (BMUB), 500 energy-efficiency networks are to have been established by 2020. The purpose is to attain the climate and energy-political goals of the Federal Republic of Germany. Meanwhile, 21 associations and organisations are participating as well as the two federal ministries. Regional companies are called upon to organise themselves in networks and to hold regular workshops on the general energy topics within the coming three years. These topics can be legal, technical and/or organisational in nature, and a specialist technical lecture is organised for this purpose. The network participants take turns at extending an invitation to host the event at their site. Thereby, when taking a tour through the company premises, they can demonstrate their energy-specific themes. Crespel & Deiters participates in the REGINEE energy-efficiency network. The REGINEE regional energy efficiency initiative was initiated by the Osnabrück – Emsland – Grafschaft Bentheim Chamber of Industry and Commerce in cooperation with the Federal Association of Energy Consumers (VEA) in Hanover. Here, the VEA association organises the visit of an energy manager to each company, who then takes a vendor-independent look at the situation on site. Together with the representatives of the company, concrete saving goals are elaborated and set down in writing as mandatory targets that are to be addressed in the near future. The objective of the network was to save 11,845,895 kWh. On 12.6.2017, C&D participated in the network meeting for the eighth time. All participants unanimously confirmed that they find the meetings useful. This is because they help in presenting the flood of energy-statutory regulations in a manner that is more or less understandable. What is more, with the help of the company tours, it is possible to gain a deeper insight into production and energy systems in other industries. The initiative’s success is monitored and verified annually by the federal government. The topic of sustainability is very important for Crespel & Deiters, and it has been certified in accordance with the ISO 14001 50001 standard. What is more, the company was distinguished with the first place in Dortmund by the Environmental Minister of NRW, Johannes Remmel on the 29th of June 2016, where it was presented the EnergieInnovationsPreis.NRW (EIP.NRW) (Energy Innovation Prize). With its new prize, EnergieAgentur.NRW would like to distinguish companies who can present successfully-implemented innovative projects in the field of energy management systems. Within merely a few days, the new construction at Crespel & Deiters has grown impressively. 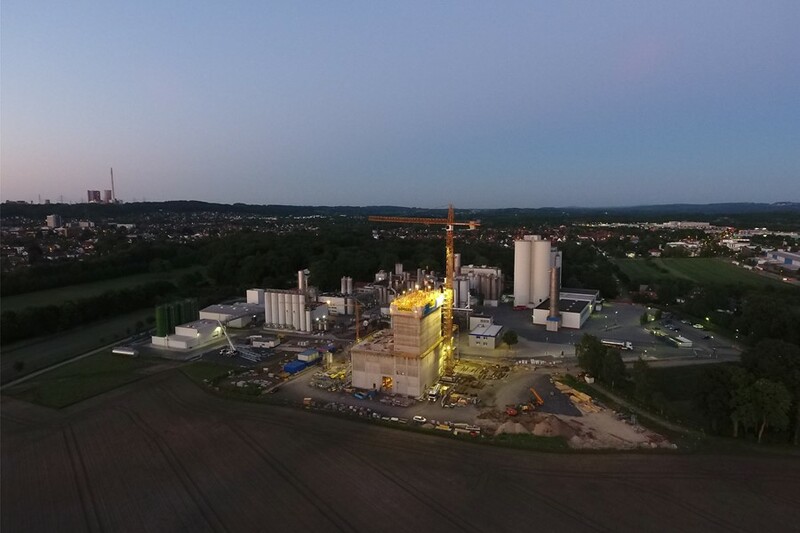 Following the pillar foundation and the erection of the 15 metre high ground floor, which had commenced in autumn 2016, we started with further milestone segments for the first construction segment of the so-called MT facility (flour storage/separation plant) during the night of 22 May 2017. Day by day, using a so-called slip-form construction procedure, the building grew to a height of 49 metres. It was completed within nine days. A new multi-purpose building is emerging to the west of the existing company complex . This will consist of a raw materials warehouse, loading bridges and the centrepiece of a wheat starch factory, a three-stage separation by means of decanter centrifuges. As explained by Dr Michael Christoph, Head of Production & Technology and Norbert Gerdes, Technical Head at C&D, during an on-site construction inspection, the new building grew about 15 centimetres per hour in a so-called slip-form construction method. The construction site of the Ibbenbüren-based company Börgel is operating 24-hours a day. For the slip-form construction, Börgel involved the special construction company Bitschnau from Austria. In the first construction stage, the new construction “accommodates”, among others, eight silo cells. These are made of concrete, as Norbert Gerdes explained. This is a tried-and-tested procedure, and the silos are more durable than aluminium silos. However, the challenge is to get the walls of the silos “egg shell smooth” to the product side, already during construction. The tasks to be completed with a new construction are definitely highly challenging, Dr Michael Christoph and Norbert Gerdes agree. There is a great team on site, and all involved companies are highly motivated and in a very good mood, despite the challenges to be mastered. The new storage/separation facility is unique worldwide in this combination. A one-of-a-kind facility, where many years of experience and state-of-the-art technical possibilities are united. 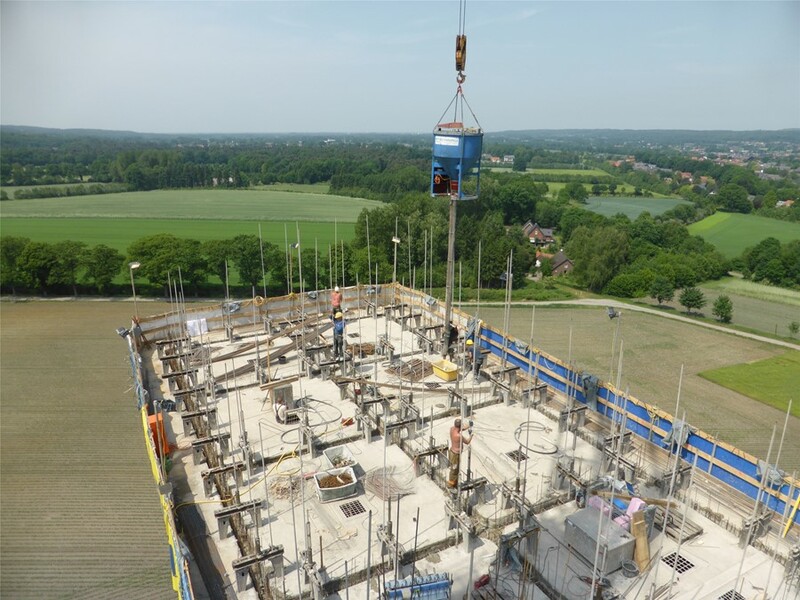 This is also something exceptional for the Ibbenbüren-based construction company Börgel: “A highly interesting project and a technical challenge,” says Matthias Guhe, construction manager at Börgel. First and foremost, this refers to the continual sliding and concrete pouring from the level 15 metres up to a height of 49 metres. Here, a 24-hour a day construction site has many special requirements that have to be satisfied. Reinhard Westkamp, overseer at Börgel, is also happy to be involved in this sophisticated project. 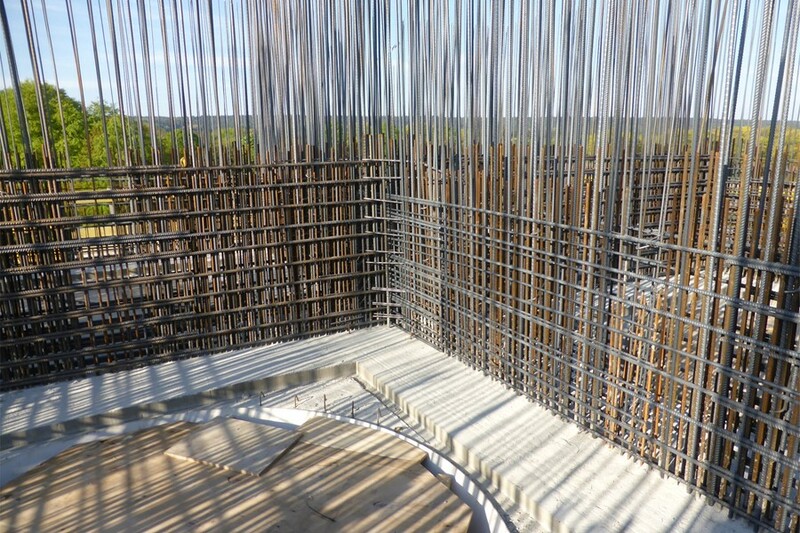 With slip-form construction, about 1200 cubic metres of concrete and 220 tons of steel are used as reinforcing material during the first construction phase. Here, at a height of 65 metres, the crane and its crew in the driver’s cabin, play a central role. The stair tower has also grown with the construction day by day. During the construction site inspection, Reinhard Westkamp referred to 205 stairs. Ten to 15 times a day, he heads up and down. The second construction stage for the MT facility is set to commence on the 5th of July. During this stage, twelve loading silos are erected. Then, using the slip-form construction method, another 1200 cubic metres of concrete and 160 tons of steel are sheeted. On 18 October 2016, Crespel & Deiters set its course for the future with a symbolic sod-turning ceremony. To the west of the company’s current complex, a new combined building is under construction that will comprise raw materials storage, loading bridges and the heart of a wheat starch factory – three-phase separation using decanter centrifuges. At 49.5 metres, it will become the company’s tallest building. During the reception Antje Marten, spokesperson for the partners of Crespel & Deiters, spoke of a “very special day”. This was true for the shareholders, the employees and also for the town of Ibbenbüren. The managing partner Gustav Deiters referred to it as the biggest investment in C&D’s 158-year corporate history. He thanked the city council for their support with the planning, and of course also thanked the C&D management team for handling the work. Dr Michael Christoph, authorised representative and head of Production and Technology at C&D, presented the new project and the new flour storage/separation facility. He said that the new technology is significantly more efficient and that the plant in the planned combination is unique globally. Truck access has also been much improved. A new road connects the new building on the ‘green meadow’ directly to the roundabout on the Gustav-Deiters-Strasse. Gustav Deiters called the new storage/separation facility ‘unique’ and that it brought together many years of experience and the latest technical possibilities. Construction was completed by Börgel of Ibbenbüren. The Mayor of Ibbenbüren, Dr Marc Schrameyer, also attended the ceremonial sod-turning. He was delighted with “the company’s clear commitment to the town of Ibbenbüren”. 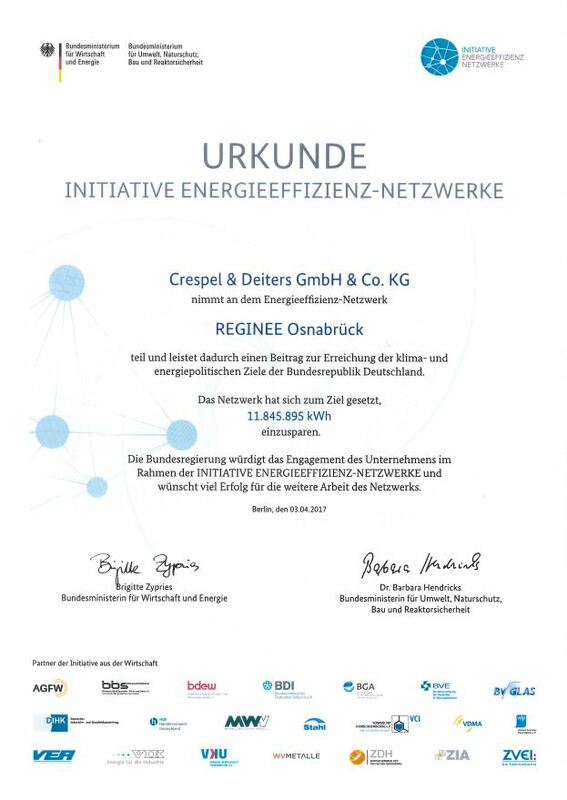 Crespel & Deiters GmbH & Co. KG was awarded the first EnergieInnovationsPreis.NRW (EIP.NRW) by the sponsor, environment minister Johannes Remmel, on 29 June 2016 in Dortmund. The EnergieAgentur.NRW intends this new award to recognise companies that can demonstrate successful, innovative projects in the field of energy management systems. “Crespel & Deiters’ submission demonstrated that an energy management system yields successes for climate protection and makes economic sense. Furthermore, the tool embodied throughout the entire organisation. 200 employees are trained annually on the subject of energy,” praised Johannes Remmel, Ministry for Climate Protection, Environment, Agriculture, Conservation and Consumer Protection of the State of North Rhine-Westphalia. Crespel & Deiters has not just begun to place great emphasis on energy management since its certification to ISO 50001. Obtaining starch is an energy-intensive process and so our operations have included systematic energy management for many years. The structure of Crespel & Deiters’ concept impressed by showing that an integrated view and evaluation of energy use results in long-term resource optimisation. Recording relevant users of energy in the production process makes potential savings apparent. For example, it was possible to accurately calculate and document the energy savings achieved by overhauling the two high capacity water boilers. But laying the cornerstone more than 20 years ago by meeting production power and heating requirements through combined heat and power (CHP) won great recognition.